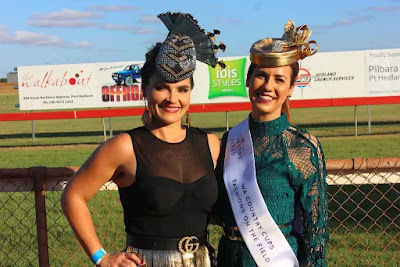 Time has quickly passed by since the 8th of October 2017 when I last had an opportunity to judge fashions on the field as the WA Country Cups representative. This race meet was at Northam in the Wheatbelt of WA and wow-wee what a fierce competition it was to judge!!! The 60+ strong entrants did not disappoint in their fashion stakes, all ladies impeccably dressed and ready to show us what they had in terms of confidence, stage presence and sass. The winner of the day was Reggie Thei who hails from Sydney. At a last minute whim, decided to head West to catch up with her racing fashion friends and enter the WA Country Cups Northam competition. Reggie was certainly a stand out on the day – clearly demonstrating that not all racing looks need to be agonised over for weeks before your competition day. Spontaneity in this case was King!